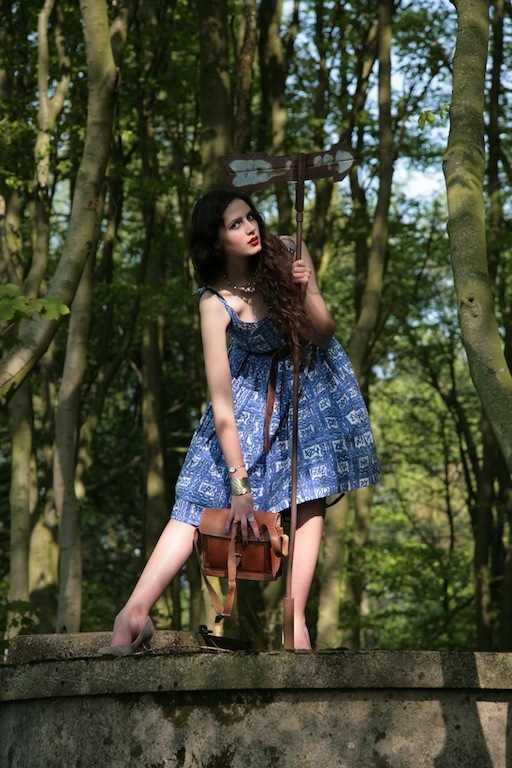 I turned seventeen last week – celebrating with a picnic, a healthy dose of vintage clothes and a walk in the bluebell wood. This last activity didn't start out as an intentional tradition, but in the same way as a well-liked phrase may quickly become a mantra, so a stroll in the evening light has become a required part of my birthday. Wandering through the blue hush is a fitting conclusion to the day’s festivities. This year the walk was shoehorned together with some photography. I climbed over fences in a vintage Parisian dress from ‘Les Marches aux Puces’, complete with a netting underskirt that scratched my legs and caught on the barbed wire as I scrambled. The heels came off to scale the huge water tank though. It stands like some kind of monument, the arrows pointing off towards trees and blue flowers. Bluebells are bright crests to the grass waves. They are somehow unexpected wherever they grow – appearing in forests, along roads and spreading out thickly across hillsides – enhancing the location wherever they pop up. The atmosphere in our favourite wood during bluebell season is hallowed. It's the kind of place where one can imagine lying down and falling asleep for days, perhaps curled up under the base of an uprooted tree, such as the one pictured. It certainly lends itself to fairytale fantasies – although I like to subscribe to the Angela Carter school of thought, whereby the heroine can rescue herself from scrapes and mishaps without assistance. This wood was not full of wolves or witches though, and the only scrapes were the ones found on my shins. The English landscape is usually characterised by greens and browns. Bright tones appear in the wild flowers that tumble down lanes and across banks: pink clover and ragged robin, or yellow buttercups, dandelions and celandines. But these are still not quite as startling as a blue flower. Candia McWilliam, in her breathtaking but relentless autobiography ‘What to Look for in Winter: A Memoir in Blindness’ describes them as such: “… [blue] flowers are frail like faded, worn cloth or like those patches of sky. They are remote, as though glimpsed. They are slips of things, a hint, like young people in the one summer when they know they are lovely but do not know the effect of it, or the sea around the next bend, or fresh water between mouth and thirsty throat. They are half-seen. Once you have lived for a certain time, a blue flower makes you both satisfied and sad.” Her use of imagery is masterful, and the story told is truthful, persistently self-analytical and as brutal as it is beautiful. I bought it from Primrose Hill Bookshop during a fleeting trip to London, recognizing McWillliam's name from an Oxford podcast I had listened to the previous week. I was mesmerized by the way she spoke in her lecture, and even more impressed with her writing when I flicked to the first page. I cannot overstate the thrill of discovering a new author or novel among shelves and tables heavy with offerings. I would happily work - or even live - in any independent bookshop, particularly one such as Daunt or Persephone (speaking of which, I was shot in the latter for Elle Japan – the photo will be on my press page shortly!) However, I now have enough books of my own to open a small bookshop or library, with new birthday additions including Alice Oswald’s ‘Dart’ and Hilary Mantel’s ‘Wolf Hall’. You can tell the age of a tree by the number of rings inside the trunk. As humans we don’t have a similar marking system – there's no new blotch or line that appears on the morning of each birthday. It's a more subtle process, body and face growing and ageing incrementally. This is matched with gradual internal change. The self, like a bluebell, can grow and wither and experience renewal year on year. My hope is that the twelve months ahead are filled with opportunities, experiences, interesting people and creative endeavours. Oh, pretty. I hope so too. I am sure there will be,my bluebell beauty. Happy birthday,my dear Rosalind. These pictures are beautiful and your outfit leaves me envious. As always your post was such a delightful read. Your birthday celebration seemed quite exciting, I think the scenic and low-maintenance sort of parties are always the best. Congratulations on making it through another year, I hope this next next year surpasses your expectations. Belated Happy B'Day, my dear Roz!!! I absolutely share your sentiments about working or living in a bookshop. I was at my favorite bookshop last inquiring about part-time work for the sole purpose of having a reason to be there daily. I also enjoyed your line about the bluebells growing, withering, and experiencing renewal. It's my favorite sentence of the day. Happy Birthday!!! I just have to say I love your dress and the way you styled it! Also, Happy birthday! Seemed like you had a really pretty one, being surrounded by amazing nature as shown in the pictures! Happy (late) birthday, looks like you had great time wandering the woods :) You look lovely! Happy belated birthday!! I love this dress, and that photo with the arrow. Roz, you are a dream captured on camera, seriously. I'd even venture to say you can't take a bad picture! Your face and figure are just stunning. I've been taking some notes from you lately about trying to match your outfits with accents of the environment behind you. 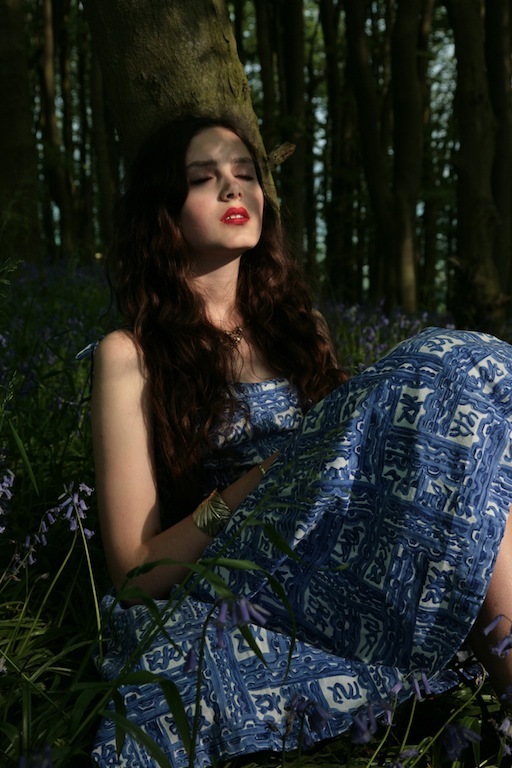 This shoot with the bluebells is wonderful example of it. Oh and PS - Happy belated birthday! Do the world a huge favor and write a book. Your writing gets my heart everytime. Happy Birthday! I can't believe you are that young. wonderful pictures as always. It is sooo beautiful there, and I love your dress! You look stunning in blue, very lovely! Hope you had a wonderful birthday. as someone whose bookshelf came crashing down off the wall just last night due to excessive weight, i can definitely agree with the desire to work/live in a bookshop - at least the shelves there would hold up. happy birthday, it looks like it was a lovely one. I've always loved field flowers and those that grow in the woods, I've always wanted to have a cottage in a buttercup field next to woods with bluebells and other bulb flowers, where I would lie all day reading. I love books and I imagine if I owned a bookshop I would happily spend all day reading and stroking the spines of the books on the shelves. It's very beautiful where you live and it looks like you had a great day. Happy (belated) birthday, I hope you have a good year ahead of you. Happy belated birthday, Roz! My birthday was last week too! :) These photos are gorgeous, you look like a forest fairy. Happy Birthday! You look absolutely lovely. Gorgeous pictures! Wishing a very happy birthday and lots of success, happiness and joy in the coming year. Happy birthday. What a wonderful way to mark the passing of another year and the beginning of a new one - a walk through the bluebell wood, yourself as a blue belle. The scratchiness on your legs somehow seems right(!) to match the woods - beauty that hides so many parts of nature that we don't see, fragility. Your writing captures the magic. I thought you were barefoot at first! I wouldn't have been surprised if you were! Happy (belated) Birthday to you. Sounds like you've had a wonderful day with a picnic and a stroll in the woods. As always fabulous pictures, dress and post. Have a great week. In the woods, near where I live, there are fields of bluebells surrounded by trees. It's a beautiful sight, only when you can actually find said fields. Hello, and happy belated birthday. I have been following your blog in silence for the past months and have been awestruck by the styling the photos and the writing that is this blog. I was floored to find out that you are only 17. You appear to be in your mid twenties. And please take that as a compliment because I mean it in the most polite way possible. You are so mature in your thoughts and appearance that I would have never have guessed. Growing up I was that person; looking older than I actually was. I have a great deal of respect for you. Always so beautiful! The pictures feels like something out of a fairytale. I tried to comment the other day from my iPad. I ended up on an error page, so I'll risk re-typing it. I'm travelling with my sister, out in nature myself for once, so this was a particularly lovely read. I loved the excerpt you chose to share, and it made me want to know more about the writer. My sister is also a podcast fan as well as a fan of NPR-- National Public Radio in America. We've been listenig to great stuff non-stop while driving across America, so between the two of you you've inspired me to put a little more effort into my listening habits. I tend to flick on the radio, do chores and feel irritated by what I hear instead of making that slight effort to subscribe to podcasts. Thank you so much for your well-wishes on my site. I've been so busy with the shotgun wedding and then agreeing to help my sister out last minute (she needed a driving companion) that I haven't been able to update or comment on other blogs. Last but not least you make me want to see the blue flowers! Although "colorful Colorado" is quite lovely. Something about the landscape, jagged mountains and pine trees, inspires haikus instead of prose. I need to update more regularly though. Your site is such an inspiration. I always love the writing as much as the pictures. P.S. Do we share the same birthday, or nearly? I just had mine as well May 18 :) Happy birthday! Happy Birthday, dear Rosalind! Your photographs bring to mind a delicate Ming vase in the forest (left behind by a traveling caravan of Chinese traders on the Silk Road?). You have such an exciting life ahead of you, if the Elle feature from Persephone is any indication. Best of all, your library of books promises a lifetime of literary pleasure. I've gotten old enough now to re-read some books I enjoyed at your age, and the phrase "love is sweeter the second time around" certainly applies in several cases. I enjoyed "Wolf Hall" and plan to get Mantel's newly-published sequel sometime soon. Let me know what you think of it. Happy birthday, dear Roz! That color of blue is absolutely ravishing. You are destined for great things in this life; I can't wait to see what the next 12 months will bring you! Happy birthday! To be so self-aware at 17 is such a gift. You will only continue to grow and become more beautiful, I'm certain. In the meantime, enjoy!! Happy seventeenth, my beautiful friend! Wishing you a grand and glorious year stacked with "opportunities, experiences, interesting people and creative endeavours." I love these photos! The dress! The colors! That face! xo. Happy 17th to you, you look gorgeous! And I love your dress a lot! Wow you have such a stunning blog and you are such a talented lady. These photographs are beautiful!